A “zombie foreclosure” is a property where the homeowner moves out after foreclosure has been started, but for some reason the foreclosure auction gets cancelled and title is never legally transferred to a new owner. So title to the property remains in the homeowner’s name but the property remains vacant. Zombie foreclosures were one of the worst blights of the housing crisis. And even today zombie foreclosures can eat into your home value. Home values are on the rise in the D.C. region. After years of population declines, D.C. is actually growing again. Moreover, investors can still find properties within the District to renovate and put back on the market. Unfortunately, investors often target areas in which zombie foreclosures are actually eating into home value. Below is an informative graphic courtesy of Orlando bankruptcy and foreclosure attorneys C.W. Franklin and Michael Stites. The graphic explains why you may have a more difficult time selling a home located within 600 feet of an abandoned foreclosure. 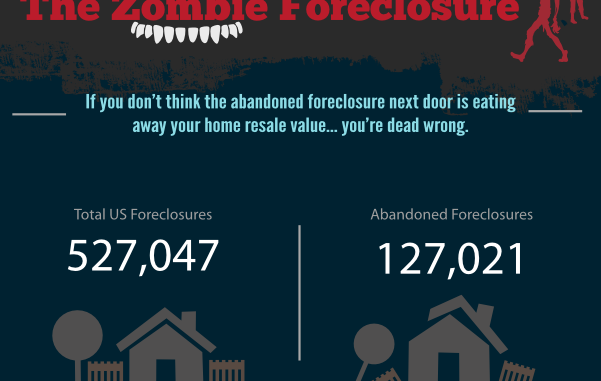 The graphic also offers some good advice on addressing the problems of zombie foreclosures. Lee Legal routinely stops pending foreclosure auctions in Washington, DC, Virginia, and Maryland.